A gladiatorial fight would usually involve two gladiators but similar types of gladiators such as the Cataphractarius, would not normally fight each other. 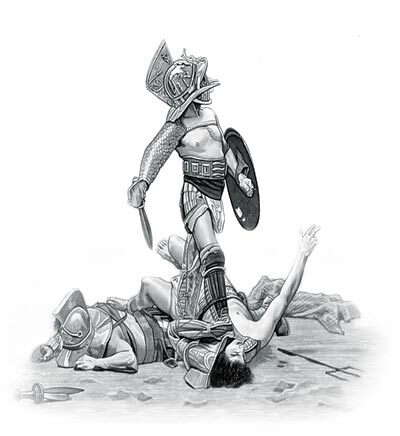 The first Roman Gladiators were prisoners of war and used the weapons and equipment characteristic of their people. The early enemies of Rome included the Samnites, the Thracians and the Gauls (Gallus) and gladiators were named according to their ethnic roots. This changed over the years and the names of the different types of gladiators reflected their combat techniques such as Secutores (chasers), Bestiarii (beast fighters) and Retiarius (net fighters). The Cataphractarius gladiator originated from the cavalry of Germany and Parthia (Persian Empire) and the Sarmatians from Russia and central Asia. The Cataphractarius was completely covered in armor and so was his horse when fighting for his country. The Roman Emperor Hadrian (r.117 – 138) introduced the Equites cataphratarii to the Roman Army were more heavily armoured than the conventional Roman cavalry. The word 'cataphracta' is often used by Vegitius, who wrote about the equipment of the army of the early Empire, to describe armor of any type, whether worn by infantry, cavalry or horses and elephants. The Cataphractarius gladiator would have worn similar heavy armor and would have rode similarly heavy-armored horses or on foot. What type of gladiator was a Cataphractarius? What weapons and armor did they use? What was their style of combat? And what type of gladiator was matched as their opponent? - Opponents: There is limited information regarding the fighting techniques or the opponents of this type of gladiator. The Cataphractarius who fought on horseback would have played interesting roles in mock battles depicting Roman successes. The Cataphractarius who fought on foot fighting Gladiators who wore little armor, so had freedom of movement, such as the Retiarius, Dimachaeri or the Laquerarius would make novel opponents for the heavily armed Cataphractarius. - Weapons: The Cataphractarius gladiator fought with a long lance (contus). A contus could be an infantry pike or a riders lance. These were long, heavy, two-handed weapons. - Body Armor and helmet worn by the Cataphractarius gladiator: Spangenhelms - Highly Protective Helmets which originated in Germany. The Cataphractarius gladiator also wore Lorica squamata, a type of scale armor worn from head to toe. The scales were wired together in horizontal rows that were then laced or sewn to the backing. The content of this Cataphractarius category on life in Ancient Rome provides free educational details, facts and information for reference and research for schools, colleges and homework. Refer to the Colosseum Sitemap for a comprehensive search on interesting different categories containing the history, facts and information about Ancient Rome. Just like the subject of Cataphractarius there is hardly a page of Roman history and the Romans that is not, on some way, connected to the Roman Colosseum which became a symbol of Rome, its society, culture and life.